If you have any photos or memories of the Basswood Grove School to share, contact us. MODERN ADDRESS Located at 8628 St. Croix Trail. DISTRICT BOUNDARIES This district was regularly losing area as several districts split off including districts 45, 49, and 59. 1854: District established and school built. 1858: The name Basswood Grove is given to the school. 1876: A new schoolhouse is built. The teacher’s desk and stool when the school was built in 1854 cost 50 cents each! The school lasted for four months in the summer, and four months in the winter, with grades 1-8. Enrollment in 1898: 28 students. In 1938: 11 students. 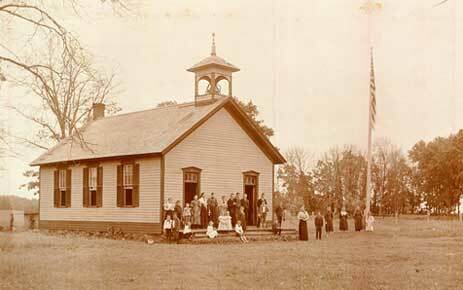 When the new school building was completed in 1876, the old building was sold for $25.25 and remodeled as a kitchen. -Auld Memories, by Mrs. M.O. O’Neil from St. Croix Falls.